There are industrial growth stocks if you know where to look. Industrial stocks may not get the same press or recognition as its consumer or tech brethren, but that doesn't mean there aren't great options for investors. In fact, some industrial companies have been generating returns for investors for over a century. Drones have been a topic of excitement in the press for years, but very few companies generate meaningful revenue from them. One that does is AeroVironment, the leading supplier of small drones to the military. The company makes drones used for surveillance and combat support, and some drones even have been equipped with strike capabilities. In the first three quarters of fiscal 2018, drone revenue jumped 36% to $153.7 million and gross margin in the segment was up 51% to $55.3 million. The company also has a growing presence with customers other than the U.S. military, highlighted by a $44.5 million order from a Middle Eastern country in March. Commercial drone use is beginning to expand as well, with surveillance, energy production, and agriculture shaping up as major growth markets. According to Statistics MRC, the small drone market is expected to grow from $6.8 billion in 2016 to $14.7 billion in 2023. Drones are AeroVironment's biggest business, but it's not the only industry in which the company is positioned for growth. AeroVironment is one of the leaders in electric vehicle (EV) chargers, with solutions for consumers, businesses, and emerging charging networks. The segment isn't growing as quickly as drones, but charger revenue in the first three quarters of fiscal 2018 grew 6% to $27.9 million and gross profit improved 17% to $7.9 million. If electric vehicles grow from about 1% of auto sales in 2015 to 24% of sales in 2025, as Bloomberg New Energy Finance predicts, this could be another segment that grows exponentially in the next decade. 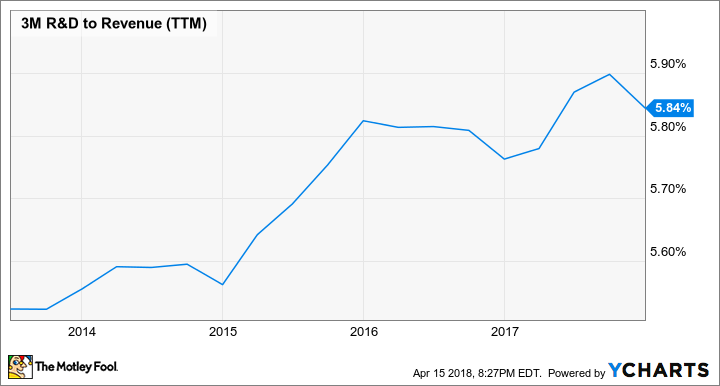 AeroVironment's current price-to-earnings ratio of 41 is expensive, but both drones and EV chargers are going to be big growth businesses over the next decade, and I think this is a stock that's worth paying a premium for. Axon Enterprise is the leader in Tasers and body cameras, which are critical tools for law enforcement. You can see below that these products have driven tremendous growth over the past decade and that trend should continue. In 2018, the company expects to introduce a new vehicle camera called Axon Fleet, a holster called Signal Sidearm that will turn on nearby body cameras when a weapon is pulled, and a records management system that could become an everyday tool for police officers. These products increase Axon Enterprise's addressable market to $6.5 billion, according to management, so current revenue of $323.8 million is just scratching the surface of its potential. What Axon Enterprise hasn't delivered is much in the way of profitability. That should also change this year as management focuses on increasing margins across the business. Guidance is for a 300- to 400-basis-point increase in operating margis to go along with 16% to 18% revenue growth. Even with a forward P/E ratio of about 100, I think this is a company that can grow profitably for many years to come. Thousands of products around us every day, probably including the device you're reading this article on, have 3M products in them and you don't even know it. The company has its hands in areas like consumer goods (Post-it notes and Scotch tape), electronics (brightness enhancing films), and automotive (abrasives). The diverse product base has made the company one of the most stable in the world, as evidenced by its 100 straight years paying a dividend. What's changed at 3M in the past few years is its growth rate. After years of stagnant results, 3M posted 5.2% organic local currency growth in 2017, and in 2018 management is projecting 3% to 5% organic local currency growth. That's up from 1.3% organic local currency growth in 2015 and a 0.1% decrease in 2016, and it's because of a sharp increase in research and development spending. MMM R&D to Revenue (TTM) data by YCharts. If 3M continues to invest in R&D, it has shown it can grow revenue by mid-single digits on an organic basis in the long term. And with a business that spans nearly every major industry and most of the globe, it has diversity few companies can match. 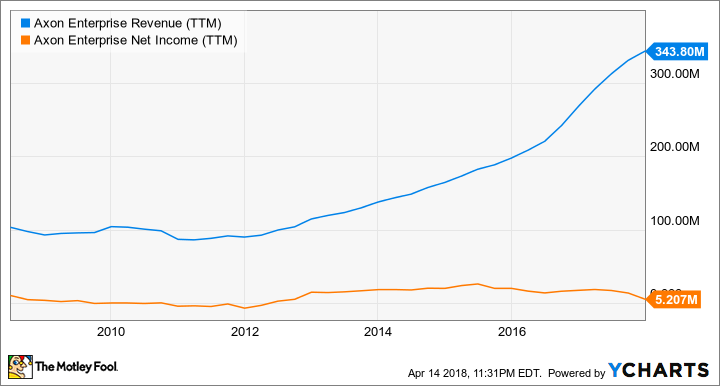 3M's stock isn't cheap with a P/E ratio of 27.5 and a dividend yield of 2.5%, but given the company's long-term history of dividend growth, this is a stock worth paying a premium for. Industrial stocks may not get the attention of some consumer or tech stocks, but that doesn't mean there aren't good buys out there. Aerovironment and Axon Enterprise serve markets that could drive growth for a decade or more, while 3M has a long-term history of increasing shareholder value and paying dividends from its diverse business. All three are worth buying today.